Again a pattern belonging to the mayfly family, and truly one for peaty waters; surely there are lots of these in the North-West. The Mallard and Claret is very old, going back as far as the 1850s; supposedly Aberdeen was the place of origin. But it is possible that an Irish version existed already at that time. A well known Northern Irish angler, Sidney Proctor, gave it to me first, at the Eany, in the late seventies and I on my first attempts to catch a salmon. Try this one, the man said and stick to the fly, pointing to his mate who was spinning, any fool can throw a piece of iron into the water. The Mallard and Claret has accounted for a lot of fish for me since; brown trout in the lakes, and regularly salmon and sea trout in the rivers. Fish it at the end of a cast, or when you use a three fly set up, put it in the middle. 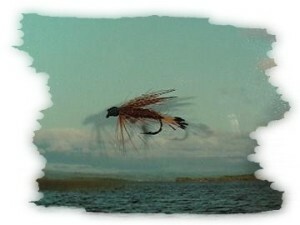 Any sturdy wet fly hook in sizes 8 to 14 will do. The idea to spend a holiday in Ireland would have probably never dawned on me, but my friend Helmut Becker, had more or less booked the ferry already; from mid July to mid August. That things are different in Ireland than in all the other countries we knew, was already observable on the ferryboat from Le Havre to Rosslare: black oily looking beer, white sticky bread; for breakfast fried kidneys, fried eggs, fried bacon and fried sausages, together with this amazing stuff called black and white pudding respectively. First we drove to New Ross, down in the south-east. A married couple, who had joined us in the last minute on the trip, had booked a caravan for hire there. To receive this box in 1979 Ireland took several hours. There was nobody at the rental; then, after ringing every number found on the booking forms, somebody came; but he: no Sir, terribly sorry Sir, was not in charge of things and had nothing to do with any caravan rentals; but yer man, he might be out on business, you see. We were told to wait, he would try to find the owner of the place; no bother at all. Finally, after a wagon was hung to our couple's car, we moved on; slowly: driving on the wrong side of the road was another new experience. My friend, the well known German angler had heard and read a lot about Irish trout and salmon and how and where to catch them, he suggested two days trout fishing at the Suir, then up to the North-West, to look for a good salmon river. We drove via Waterford and Carrick on Suir to Clonmel. The constant alteration between sunshine and clouds produced a light which made clear where the Forty Shades of Green came from: a green green Island. And it soon became pretty clear how big was Irish influence on arrangement and design of villages and towns in America's west. With the first beer in a pub we were confronted with the customary question: you are on holidays? accompanied by a friendly smile. You are on holidays? no matter whether in the pub or restaurant, shop, petrol station, this form of immediate communication, combined with a healthy nosiness, enabled us of course to drop such important questions like where to fish? or how is the fishing? If the approached person didn't know anything about angling hold on for a second and after a very short while someone was there to talk extensively with us about the fishing. So, we found, somewhere outside of Clonmel a place directly at the river, big enough for the two cars, caravan and a tent for Helmut and me. The Suir, though a limestone river, had this typical Irish colour: not gin-clear like Yugoslavian, French or English chalk streams and not cloudy or muddy brown like the rivers of north central Europe and definitely no trace of green in them, but a deep clear brown; depending on the dissolved peat contents, varying from light brown to Guinness black. No wonder so many rivers in Ireland are called Blackwater. The tent was erected and it was time to have a stroll along the river, with fishing gear though, but actually just to have a look. The Irish anglers we saw fishing the Suir for brown trout used endless long looking double hander rods, using more or less always the same length of line, down and across. That looked very round, there were no fast or hurried movements, almost leisurely, how these people stood there in the middle of the river, offering their flies, two, three or even four at the line, wading a step or two down after every couple of casts. They are fishing the English style, explained Helmut, long rods with slow action and several wet flies; not like us, short rod fast action and a single dry fly or nymph. Indeed, it was fly fishing, but totally different to what we knew and practised. Something else distinguished us from these Irish anglers at first glance: with our olive green waistcoats, bold head garments and accessories we endeavoured to look like hardy guerrillas. A harsh contrast to our colleagues here, wearing tweed jackets, some even had ties and appeared very cultivated. The fishing paraphernalia, not like ours stuffed into the waist-coat's pockets, but in compartments of the bag; into which every good fish disappeared as well. Of course we regarded our way of fishing ( though we hadn't dipped a fly into Irish water ) and our sport interpretation as more progressive, up to date; the real thing actually. We came to a stretch of water, maybe 60 or 70 meters long, fished by three anglers, again standing right in the middle of the river, casting towards the far bank. One of them waved to us, another waded ashore, explained to me that I should take over his place. This generosity surprised and embarrassed us. Again he pointed out the spot: give it a go. Well then, off into the river I waded, it was easy enough, good knee deep, solid ground, moderate currant. The river, about 40 meters wide, seemed deeper at the far side. Arriving at the indicated spot, I cast some nymph towards that deeper water. The second cast finished, the Irish angler was already beside me, the open fly box in his hands. One fly is no good; at least two, was the message, showed me how to make up a cast and put two of his flies on. That my seven foot rod was too short for the job became clear after the first cast: the flies came round to fast and didn't drift naturally. After the second cast I had to realise that it is much easier to get tangles when fishing more than one fly on a short, fast rod. Again it began to dawn on me: there is no patent remedy for the many different situations in fly fishing. It is a constant transfer problem: how can I bring my present knowledge into harmony with new or other requirements and conditions?